We arrive on a fine summer day, one where morning clouds were burning off and a nice breeze kept the air moving as the temperature climbed to meet the arriving sun. My hiking partner for the day was my mother-in-law, S. She is always interested in what I am doing and wanted to see this place where I have been spending so much time. When we arrive there are many volunteers cleaning up after yesterday's Burning Beast BBQ festival. It is a major fund raiser for Smoke Farm, a barbeque cook-off with 15 different types of meet for the guests to sample. The tickets for the event sell out very very quickly every year. We walk up river on the rough grassy road that passes through the new cottonwood forest. The new deck on the double log bridge makes the route passable for S and we spot tiny salmon swimming in the creek below. We stop at the Grave of Vitus Bering, which also gives S a good feel for a cedar forest. I talk about nurse stumps. I point out all of the different plants growing from the tops - that cedar tree, that evergreen huckleberry, those ferns. Then we continue upriver. There are more thimbleberries than on my last visit and they are right at their peak of flavor. S eats as many as I can pick and they are her first thimbleberries. It is a good place to have your first thimbleberry and I tell her where I ate my first one - on a mountain road in the Bugaboos of Canada. I imagine that a lot of people can remember where they had their first thimbleberry. I move one of my projects out of the way of this weekends festival. I figured it to be a 4 hour job, but it goes in one and a half. I have been building, making or moving for what seems like a solid month and today I feel most like doing nothing. I sit under the tin roof of the shop building until the lightest of rain showers begins to tap away. The thought of rain raises my interest in taking a hike. Everyone has a different idea or a different identity for what Smoke Farm is - rain is one of the strongest of markers in how I identify it. 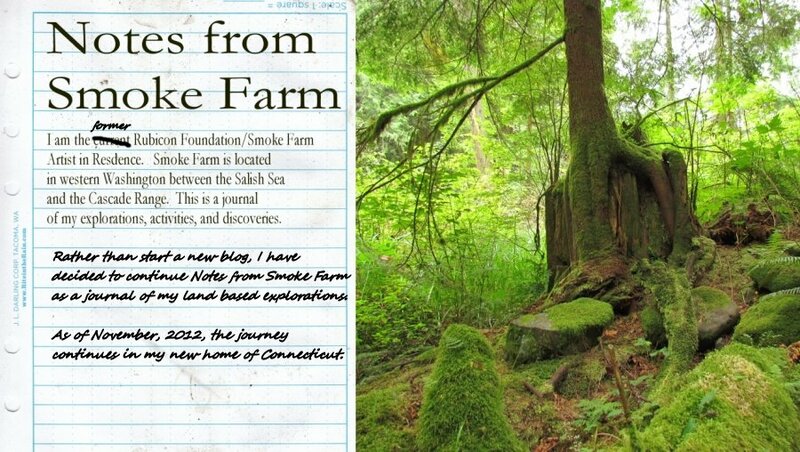 For myself, Smoke Farm rises to its full potential when it rains. I head up river stopping at the bridge over the creek to make sure that it is as fine a place to sit as I keep telling people. It is. My ears catch a purring in the tall grass behind me. I freeze and wait. A few moments pass and a large dragonfly rises up and heads off down river. I walk up the river road picking thimbleberries as I find them. The wet spring has made them unusually juicy this year. I think that they are best eaten by using the tongue to smash them against the roof of the mouth. This way none of the raspberry sherbert flavor is wasted, it all ends up on the taste buds. It is a delightful burst of one of the best tasting berries ever. There are two frogs and a dozen tadpoles in the longest of the road puddles - it is 50 yards long and thus, perfectly good frog habitat. I see many fresh deer tracks and a few raccoon tracks as I walk the road. But, when I get to the upper beach, I find an unexpected track, one that takes a few seconds to recognize because it is unexpected. In the silt, up under the first edge of brush where the river lets the well rooted plants stay, is the track of a small child. I find myself thinking that it is a very fine spot to bring a small child. It was just a work day today at the farm. O, A and M came up. O is one of the kids from M's microcamps, which unfortunately got canceled this summer due to a shortage of available volunteers. Since O likes to build things, and I have plenty of ideas for building things, and little time to get it all done...it's perfect. We all take a walk out to my installation to start with. To get there, we cross the log bridge that me and my friend A put a deck on. All winter long I had to inch across the deck with my camera and field pack, the logs slippery with frost, or if it was warmer, just wet and slick. The bridges have been a way to cross the creek. They've been an obstacle themselves - only preferable to a waist deep ford in cold water. When we finished that first deck, me and A marveled at how the bridge had now become a place to stand or sit and just enjoy the clear open view of the creek. We got a lot of positive comments from people about the improvement. We've noticed that snakes like to sun themselves on the new deck. We return to the shop and set up a production line. I brought a good amount of wood from home that I had saved for building doors and windows but don't need anymore. O runs the chop saw while me and A feed and stack the decking. We are going with a half-chevron design and we joke about people getting dizzy and falling off of the bridge. With everything pre-cut, we head out and begin nailing the deck. It is almost 80 degrees today and we complain about the heat never forgetting that everyone else in the country is dealing with triple digits. But, with us not used to the heat it does sap our energy. I tell O that he will be a popular guy when people find the new bridge deck. It was a good day to sit on a bridge. My hiking partner for this day at the farm is B. She is 5 years-old. I hitched a ride with B and her mom who is busy collecting cobblestones from the river for an art project. B and I head up river picking the occasional ripe salmon berry or thimble berry as we go. The thimble berries have just started to turn and I suppose that in a week one might just spend an hour picking and eating one berry at a time. No one collects thimble berries because they are too soft and won't survive the carry back to the house. But the tart raspberry sherbert flavor makes them worth eating when one finds them. Only the high mountain huckleberry is better in my mind. We stop at one of the usual spots to check for animal tracks. But, it appears that yesterday's rain has washed all away. So, the two of us continue up to the slough, which is running just a bit deeper than the ankles. B splashes and walks in the water until she finds a spot to stand in that is deeper than her boots. She doesn't complain. I don't have kids of my own and I watch how B sees the forest. When I take adults out, they often fail to see the individual tree instead grasping the forest as a vision - which is why they often don't know where they are when we wander off trail. I don't know if B sees the forest, but she sees the details. A red berry steers her off route, a splash of a creek turns her left, a long muddy puddle slows her to a crawl as she inches through until she slips and falls, refilling the boots. She doesn't complain. Her idea of where she is does not go too much farther than her fingertips - There's so much to see and so much to do right there.